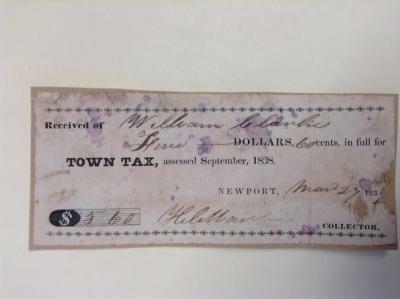 Receipt for Newport town tax received from William Clarke, totalling five dollars, 60 cents. 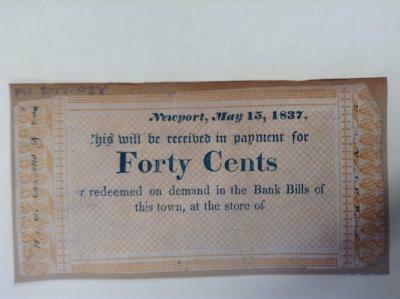 Dated March 27, 1839. Military shako style hat. Leather with brass badge over visor. Same as D270, but brass is more tarnished. No. 322 removed. 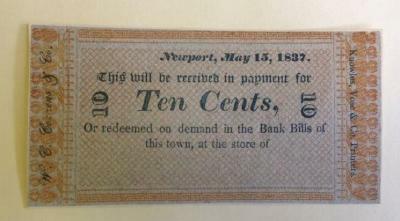 Made by Edward Barr of Providence. Corsette: white linen with brown trapunto-style quilting and nine pairs of ivory (?) grommets for lacing. Laces missing. 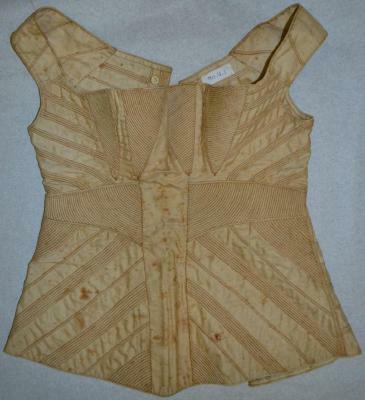 Handmade by Rebecca Coggeshall Barlow in 1839 as part of her wedding costume. Small baby pillow with tassles at each of the four corners. 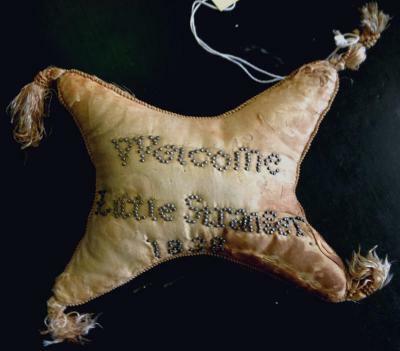 Beads are applied to read, "Welcome Little Stranger 1838." On reverse beads spell the monogram "FMS." 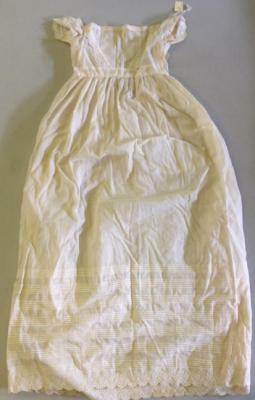 Long white infant's dress, christening robe of Thomas P. Newton. Low neck, short straight sleeved, trimmed with insertion and edging of embroiered net. Long white infant's dress. Low neck, short straight sleeves, hand embroidered with 7 groups of tucks at bottom. Star-shaped pincushion with four points and tassels on the corners. Pins spell "Welcome Little Stranger 1838", on reverse the initials "FMS" can be seen. Reference: Swan "Plain And Fancy"
this town, at the store of"
White mitts with ribbon on top. Torn. 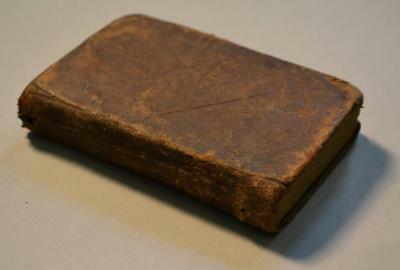 Leather covered book, "Wisdom in Miniature". 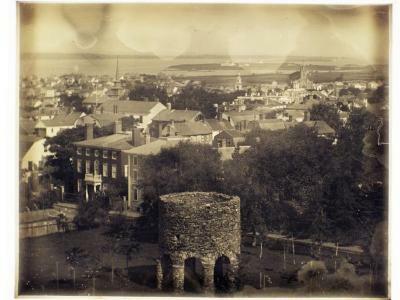 Inside book is inscribed, "R Williams to Catherine Williams 1837". Inside cover and pages feature pen scribbles and possible letter practicing. 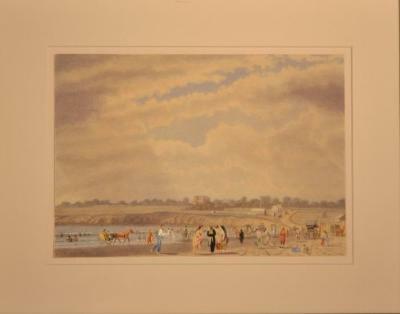 Watercolor on paper of Newport Beach by Felix Augustus Peckham, b. 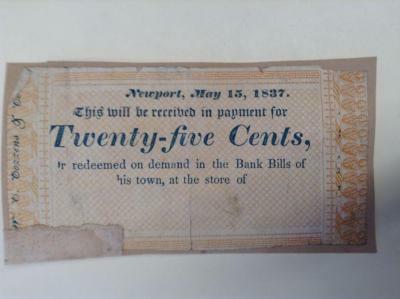 1837, d. 1876. 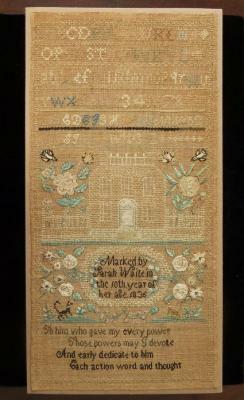 Viola with maker's label inside: Manufactured By/ Peter M. Slocum/ For I. Munro/ Newport R. I./ 1836"
Cape for a dress. Small red and green figure on tan printed cotton. Wadded bonnet in violet silk, lined in pink, with pink plaid ribbon. 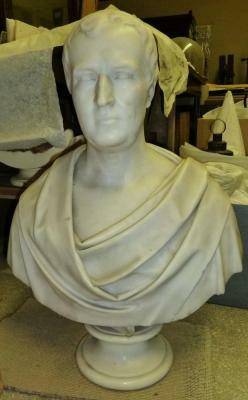 Male bust of Samuel Ward; short straight hair, no pupils on eyes, long, narrow nose, wrap around chest. 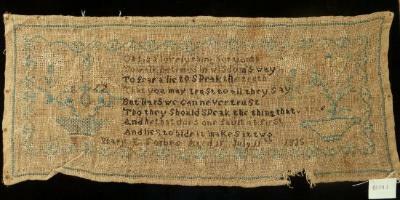 Horizontal format, central eight line verse, floral border (light blue). 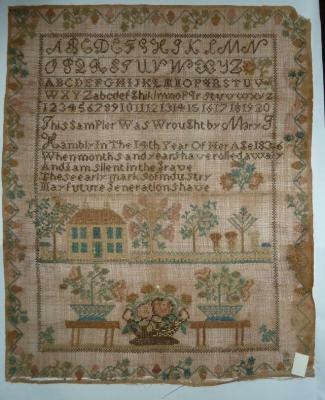 Completed by Mary E. Forbes at age 11. Silk thread on linen. White embroidered linen infant's cap. Lady's kid gloves, white with blue satin trim. Sprig of flowers in green and blue on back. Blue satin wrist bands. 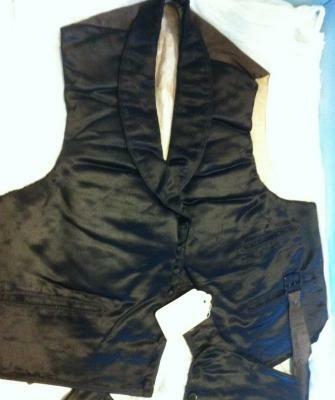 Black satin padded front, sleeveless, brown buckle back. Shawl collar, three pockets, seven buttons.